WASHINGTON, DC, July 5, 2011 (ENS) – The Bureau of Reclamation and the National Park Service are starting to develop a Long-Term Experimental and Management Plan, or LTEMP, for managing Glen Canyon Dam on the Colorado River over the next 15 to 20 years. The public process opened today will be the first comprehensive review of Glen Canyon Dam operations in 15 years, officials said. It is aimed at ensuring that flow regimes on the Colorado River meet the goals of supplying water for communities, agriculture and industry, and protecting the resources of the Grand Canyon, while providing hydropower. “The Colorado River is the lifeblood of communities across the West, and its water is vital to the health of our lands and wildlife, to powering our communities, to feeding our families, and to the ecosystem of one of our national treasures,” said Secretary of the Interior Ken Salazar, who hails from Colorado. “We need to make use of the latest science to develop and implement a structured, long-term management plan for the Glen Canyon Dam that adheres to the Law of the River, respects the interests of the tribal nations, and sustains the health of the Grand Canyon and the communities that depend on its water, consistent with the Grand Canyon Protection Act,” Salazar said. Glen Canyon Dam is a concrete arch dam on the Colorado River in northern Arizona. Its reservoir is Lake Powell, the second largest artificial lake in the country, extending upriver into Utah. The dam was completed in 1966 to provide hydropower as well as regulation of water flowing from the upper Colorado River Basin to the lower to fulfill the Colorado River Compact. Signed by seven U.S. states in 1922, the Colorado River Compact divides the flow of the Colorado River and its tributaries among them. Each half of the Colorado River Basin – the upper basin, with Colorado, New Mexico, Utah and Wyoming – and the lower basin, with Arizona, California and Nevada – was allotted 7.5 million acre feet (9.25 km3) of water annually, and a treaty between the U.S. and Mexico was signed in 1944 allocating 1.5 acre feet (1.85 km3) to Mexico. The LTEMP, which will be developed based on public input and the latest science, will guide the development of future experimental and management actions as part of the ongoing Glen Canyon Dam Adaptive Management Program. The plan will consider potential future modifications to Glen Canyon Dam operations and other resource management and protection action. It will determine if a Recovery Implementation Program under the Endangered Species Act will be undertaken for endangered fish species below the dam. Secretary Salazar observed that considerable scientific information has been developed since the Adaptive Management Program first began in 1996, which will be considered in preparing the environmental impact statement for the LTEMP. The Bureau of Reclamation and the National Park Service will co-lead the environmental impact statement – Reclamation has primary responsibility for operation of Glen Canyon Dam and the Park Service has primary responsibility for Grand Canyon National Park and Glen Canyon National Recreation Area. “We will build upon the good science and experimentation that has been ongoing through the Adaptive Management Program and put together a plan that incorporates that knowledge, but leaves flexibility for future adaptation,” Castle said. Federal, state and tribal governmental agencies will have the opportunity to become cooperating agencies in the EIS. 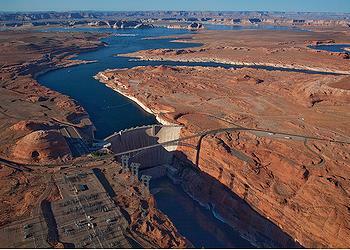 The Glen Canyon Dam was constructed within traditional Southern Paiute territory. It flooded San Juan Paiute farms and affected the plants, animals, and culturally significant places downstream. Because the traditional lands of the Southern Paiute people have been affected by the dam, in 1991, three federally recognized Southern Paiute tribes – the Kaibab Band of Paiute Indians, the Paiute Indian Tribe of Utah (representing the Shivwits Band), and the San Juan Southern Paiute Tribe – agreed to participate in studies to identify cultural resources impacted by the dam and to recommend strategies for their protection. “Another major change caused by the Glen Canyon Dam has been the regulation of river flows which has made it possible for commercial and private river trips to take approximately 20,000 people per year through the Colorado River Corridor. It is impossible to ignore visitor impacts as a significant impact of the dam,” the Paiute say. Public meetings will be held later in the year to solicit comments on the scope of the LTEMP environmental impact statement and the issues and alternatives that should be analyzed. That information will be added to input received from the Adaptive Management Work Group. The meeting schedule and the period for receiving written comments will be announced shortly. Click here to read the Notice of Intent published today in the Federal Register.